Figure 1. Lawrence stands beside the lens with a giant lens cap under this left arm and a watch in his right hand making the exposure The roller curtain operator stands at the rear and all attention is concentrated on the train. Division of Photographic History, National Museum of American History, Smithsonian Institution. After months of planning, building, and testing George R Lawrence stood by the lens of his mammoth creation, the moment had arrived. The tension of the occasion can be seen in his face and in those around him on the photograph that was taken to record the event. The roller curtain of the plate holder was retracted by his assistant at the rear of the camera and Lawrence removed the lens cap. Two-and-a-half minutes later he replaced the cap and the exposure was completed. It is very likely that the final abatement of tension did not occur until sometime later in the dark room when the crisp image of the train showed up on the glass plate. Only then could Lawrence be certain that he had solved yet another problem and, in the process, broken new ground in the evolving art and science of photography. 1. Times-Herald, 24 October 1900. THOMAS YANUL of Chicago provided a photocopy of a newspaper article entitled 'The Largest Photograph in the World'. It was one of several such articles pasted in a surviving scrapbook that had belonged to George R Lawrence. Unfortunately, the place of publication of the newspaper and the page number were missing, and attempts at determining these facts have proved to be unsuccessful. 2. G. J. CHARLTON, The Largest Photograph in the World of the Handsomest Train in the World, Chicago and Alton Railway, probably published in Chicago in 1900, text and photographs on 13 unnumbered pages. A copy was seen by me at the Chicago Historical Society. 3. Times-Herald, 24 October 1900. 4. P. R. Duis and G. E. HOLT, 'The fearless George Lawrence', Chicago Magazine (November 1978), 258-262. 6. Anonymous, 'George R. Lawrence biography', The Encyclopedia of Photography, Vol. 11, New York: Greystone Press, 1974, 1992. 7. H. H. SLAWSON, 'George R. Lawrence', The Complete Photographer, 6: 34 (1941), 2217-2221. 8. Anonymous, 'Photography by artificial light', The Inland Printer (December 1897), 367. 10. S. BAKER, 'The hitherto impossible in photography is our specialty', Smithsonian Air and Space (October/November 1988), 64-68. 11. 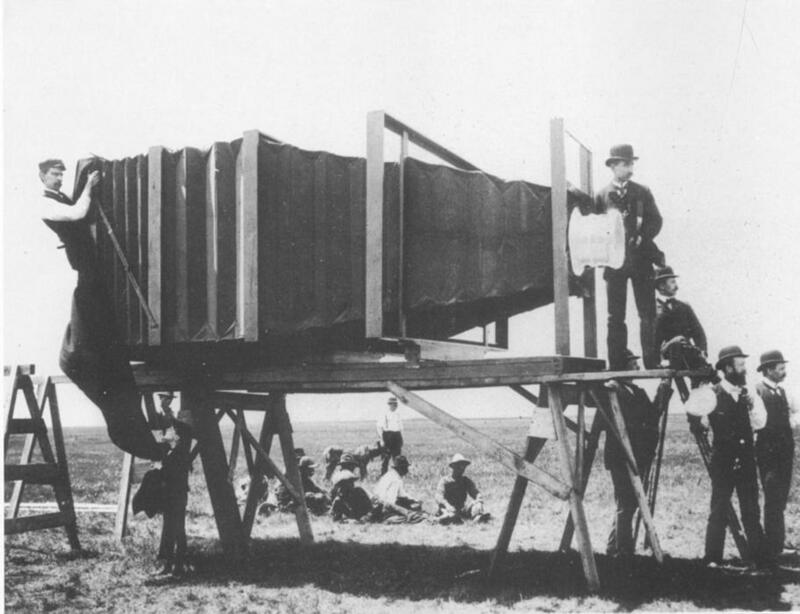 Anonymous, 'The largest camera in the world', Scientific American, 84 (2 March 1901), 132. 13. G. J. CHARLTON, The Largest Photograph in the World of the Handsomest Train in the World. 14. G. J. CHARLTON, The Largest Photograph in the World of the Handsomest Train in the World. 15. H. H. SLAWSON, 'George R. Lawrence'. This article first appeared in the History of Photography, Volume 1, Number 2, Summer 1991.